THE GEORGE BENSON - FRIDAY MUSIC 180 GRAM AUDIOPHILE VINYL SERIES CONTINUES!!! CELEBRATING 50 YEARS OF HIS CLASSIC JAZZ/FUNK FUSION MASTERWORK "THE OTHER SIDE OF ABBEY ROAD"
FIRST TIME 180 GRAM AUDIOPHILE VINYL RELEASE!!!! INCLUDES HIS SMASH HIT INTERPRETATIONS OF "HERE COMES THE SUN" "GOLDEN SLUMBERS" "COME TOGETHER" "I WANT YOU" & "SOMETHING"
STELLAR CAST OF MUSICIANS INCLUDE: GEORGE BENSON, HERBIE HANCOCK, BOB JAMES, IDRIS MUHAMMAD, RON CARTER, HUBERT LAWS, SONNY FORTUNE, DON SEBESKY, RAY BARRETTO & MANY OTHERS. 1969 was an incredible year for the music world. The Woodstock festival, underground radio was at full peak, and of course The Beatles delivered what many consider their greatest work "Abbey Road." At the time, jazz and funk pioneer George Benson and his producer Creed Taylor immediately went into the recording studio, three weeks after The Beatles release, and recorded the amazing jazz/soul/funk classic "The Other Side Of Abbey Road" for A&M Records. George Benson put together a team of players which today reads like a the who's who of jazz royalty, including greats Herbie Hancock, Bob James, Idris Muhammad, Hubert Laws, Ron Carter, Don Sebesky, Sonny Fortune, Ray Barretto, etc, and delivered one of the all time greatest acid jazz/fusion albums of our time. 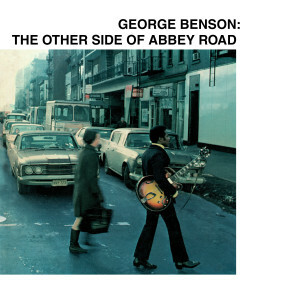 On "The Other Side Of Abbey Road" we get to hear George Benson in many modes, riffing out to a small combo sound, into a fully orchestrated setting, or solo with his incredible vocals styling on Beatles' classics "Golden Slumbers" "Oh! Darling" " and his big hit interpretation of "Here Comes The Sun." The funk continues as Benson throws down a stellar groove on "Come Together" and rocks the house with "I Want You"
The smash Lp closes out things with "The End" which brings all the players upfront, as George Benson plays his lead guitar with clarity and tone, rounding the album out with a fascinating ending. Friday Music is no stranger to the music and artistry of George Benson. We've continue to release his fine music here with the likes of "Breezin'" and "In Flight" and now we are very pleased to announce the first time ever 180 Gram Audiophile Vinyl release of his 1970 classic "The Other Side Of Abbey Road." Mastered impeccably by Joe Reagoso at Friday Music Studios from the A&M Records tapes, this super limited edition album will also be featured in the long out of print striking gatefold cover, not seen in decades.